WHAT’S SO GREAT ABOUT WOODCUT BLOCK PRINTS? 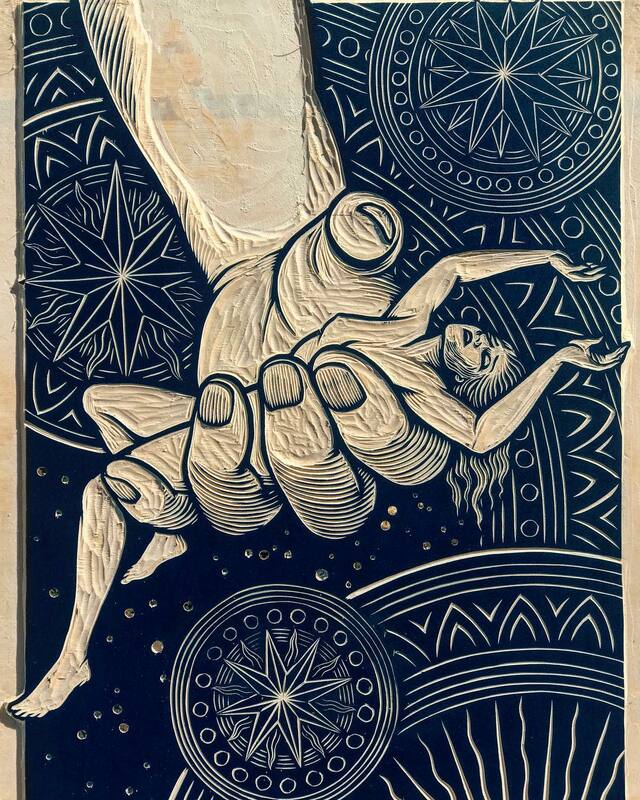 Join us for this giant show of original woodcut block prints and see for yourself what makes them unique. Transparent inks overlap to create multiple colors, and the impression of the woodblock on the paper creates a sculptural depth that can only be appreciated in person. Peter’s first black and white block prints led to a Grammy nomination in 2011 for album packaging on Anaïs Mitchell’s “Hadestown”. This show encompasses the work he’s done since then to expand his palette using color, pattern and narrative imagery to illuminate his visions. Opening reception will include a small print demo. Peter Nevins is a Portland favorite. His hand-cut giant wood blocks are stunning to behold, and his care and craft in printing prints is beyond reproach.